The 2018 Annual and Summary Reports for the Massey Water System. The Reports are based on information provided by Operators as of Feb 07, 2019 in accordance with Section 11 and Schedule 22 of O. Reg. 170/03, under the Safe Drinking Water Act. A confirmation of submission of the PTTW reporting, as required by O.Reg 387, is included as part of the report. Please note the following change for Regular Council meetings. Beginning January 23, 2019, Council meetings will commence at 6:00 pm. Meetings will remain on the second and fourth Wednesday of each month. The Junior Volunteer of the Year was awarded to Quynlan Vuorensyrja. He is always on hand to help at many community events in Walford and throughout the Township of Sables-Spanish Rivers. He is a member of 4-H, active in sports, helps with children’s activities, as well as being involved in assisting at the Walford playground and outdoor rink. Whatever an organization needs help with; Quynlan Vuorensyrja is there and always exhibits respect and courtesy for all. Council extends their heartfelt appreciation and congratulations to Quynlan for all he does to help in the community! The Senior Volunteer of the Year was awarded to Gail Whalen. An active member of the Walford Community Centre Board since its inception in 1985, Gail has served as the Catering Convener and is an advocate for youth and seniors’ programming in the community, as well as a dedicated member of her parish and the Catholic Women’s League. Gail’s willingness to lend a hand whenever called upon and her dedication to her community has not gone unnoticed. Council would like to take this moment to congratulate and thank her for all she has contributed to the residents of the Township of Sables-Spanish Rivers. Blaise Gravelle is the 2018 recipient of the Township of Sables-Spanish Rivers Bursary. This is awarded to a deserving student attending Espanola High School who resides in the Township and is continuing post-secondary studies. The Bursary was presented to Blaise by Deputy-Mayor Patricia Hnatuik at the EHS Convocation. Congratulations Blaise! The winner of the Business Success Award is John’s Auto Repair & Sales, located in Massey. Established in 1995, John’s Auto is a complete auto repair and maintenance centre that has helped both residents of the Township of Sables-Spanish Rivers and many a stranded tourist in the area with fast service and being able to recommend local attractions, places to eat, and lodging. In addition, John’s Auto has donated to a variety of charitable functions and worthy causes since establishing their business. Congratulations on being selected as the recipient of the Business Success Award. 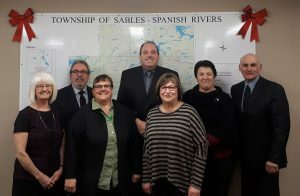 The Economic Development Committee applauds your efforts and commends you for your vision, dedication and for choosing to operate a top-notch business in the Township of Sables-Spanish Rivers. We wish you continued success throughout the coming years. Please include your name, phone number, the name of the business you are nominating, and why you feel they are deserving of this award. *Please ensure that your reasons are for actions and improvements taken within the past year and that the business is located within the Township of Sables-Spanish Rivers.